You are currently browsing articles tagged Buddhist gods. The bodhisattva Avalokitesvara trying to teach me patience and compassion. God knows I need it. Photo by David Lansing. There was another Buddha at Richmond’s International Buddhist Temple that I liked a lot better than the Laughing Buddha: Avalokitesvara. Probably the most popular bodhisattva is Avalokitesvara, which means something like “the Lord who looks down on the world.” That’s because he’s keeping an eye on everyone. Actually, lots of eyes. He’s said to have 10,000 hands and 10,000 eyes in each hand, the better to see you with, my dear. I like that idea. Which is maybe why I spent a lot of time on Saturday hanging out Avalokitesvara. Evidently August 6 is “Avalokitesvara Bodhisattva Enlightenment Day” here at the temple. Lots of chanting going on. Maybe I should come back. 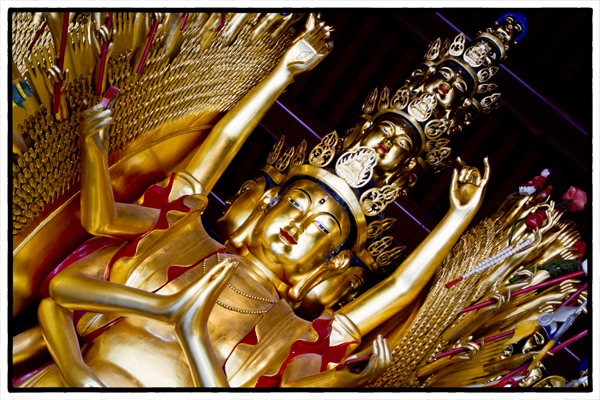 If you wonder what chanting to Avalokitesvara might sound like, check out this YouTube video.